Calcium Oxide is also known as Quick Lime. It is a white, amorphous solid. Heating of calcium carbonate forms calcium oxide and carbon-dioxide. Calcium oxide on hydrolysis forms calcium hydroxide. Calcium carbonate on decomposition forms calcium oxide and carbon-dioxide. Calcium oxide on reaction with carbon-dioxide forms calcium carbonate. It is an important ingredient for preparing cement. Caustic soda and calcium oxide is used in the manufacturing of sodium carbonate. Also, known as Slaked Lime, Ca(OH)2. Adding water to calcium oxide forms calcium hydroxide. It is slightly soluble in water. Passing carbon-dioxide through calcium hydroxide forms calcium carbonate and water. Diluted solution of calcium hydroxide is known as Lime Water. A suspension of calcium hydroxide particles giving it a milky aspect, is known as Milk of Lime. Passing of carbon-dioxide through calcium hydroxide forms calcium carbonate. But when excess of carbon-dioxide is passed through, calcium hydrogen carbonate is formed. Passing chlorine through calcium hydroxide forms hypochlorite. Hypochlorite is one of the constituent of bleaching powder. It is used to prepare building material mortar. Calcium hydroxide is also used in tanning industry, glass making etc. Calcium carbonate occurs in different forms such as limestone, marble, chalk etc. When carbon-dioxide is passed through calcium hydroxide, calcium carbonate is formed. Reaction of sodium carbonate with calcium chloride also forms calcium carbonate. Calcium carbonate is insoluble in water. Decomposition of calcium carbonate forms quick lime, that is, calcium oxide and carbon-dioxide. Marbles made up of calcium carbonates is used as building material. Used for the extraction of the iron. Used in the manufacturing of the paper. Calcium carbonate is also used to treat acidity. It is also a constituent of toothpaste, chewing gum etc. It is formed by the heating of gypsum, that is, CaSO4.2H2O. After heating gypsum for a long time, it forms anhydrous calcium suphate. Anhydrous calcium suphate is known as “Dead Burnt Plaster”. It is used in building industries. It is also used for fixing bone parts after fracture. It is also known as Portland Cement. It is the most commonly used building material. It is made up of silicon dioxide, calcium oxide, aluminum, iron, and magnesium. Limestone and clay are two raw materials for cement formation. Another important ingredient of cement is dicalcium silicate, tricalcium silicate and, tricalcium aluminate. It is the most common material used during plastering. It is used in construction of dams, bridges, and buildings. Q1. What is the state of calcium at room temperature? Sol. At room temperature, calcium exists in the solid form. Q2. Is calcium a solid or a liquid? Sol. Calcium exists naturally as solid. Q3. 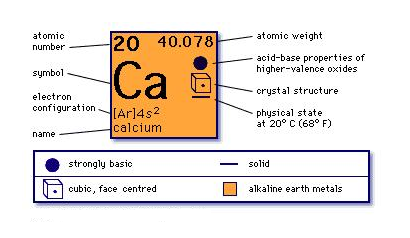 What are the uses of the element calcium? OR What is calcium used for? Sol. Calcium is used as a reducing agent during preparation of thorium and uranium. It is used in making alloys with aluminum, copper, lead etc. Calcium is essential for bones and teeth. 40Ca, 42Ca, 43Ca, 44Ca and 46Ca.